It sounds like the plot of a Disney cartoon, but instead it's the subject of our weekly FEEL GOOD FRIDAY this week. A depressed goat at an animal sanctuary in California went on hunger strike for six days until he was reunited with its best friend a donkey. For 10 years, a goat named Mr. G and a donkey named Jellybean lived together in neglect "on the property of a woman who could barely care for herself, let alone the dozens of dogs she hoarded and three barnyard animals," Animal Place stated. After the creatures were rescued, the Grass Valley, Calif., organization took in Mr. G, but sent Jellybean off to another sanctuary. Mr. G was given a new home, room to run and lots of love and attention from his handlers. He should have been the happiest goat in the world. Except he wasn't. Mr. G refused to eat and he would just lie in his stall with his head on the ground, barely moving. Animal Place staffers were worried that Mr. G was ill, but after health exams they realized that the lonely goat was depressed. He was mourning the loss of his best friend. Animal Place figured out that Mr. G was in mourning, because he had been separated from his best friend of 10 years, a burro named Jellybean who was also rescued from the hoarding property. Jellybean was taken to a different sanctuary, so Mr. G assumed his friend was gone forever. Staff tried every treat, but nothing worked. So a volunteer offered to make the 14-hour round-trip journey to go get Jellybean from the other rescue shelter to reunite Mr. G with his best friend. Animal Place knew that they had to do something to console the grief-stricken goat, so they made arrangements to relocate Jellybean. The rescue group filmed the big reunion in one irresistibly sweet video. But before Mr. G could even see Jellybean come off the truck, he could hear and smell him, and he instantly perked up. Demonstrating a bond so strong it could break the Internet. He knew his best friend was back. And for the first time in days, Mr. G was up and moving around. WATCH: The full video to see what happened next. Just be sure to have a couple of tissues handy. Jellybean and Mr. G will spend the rest of their days together. 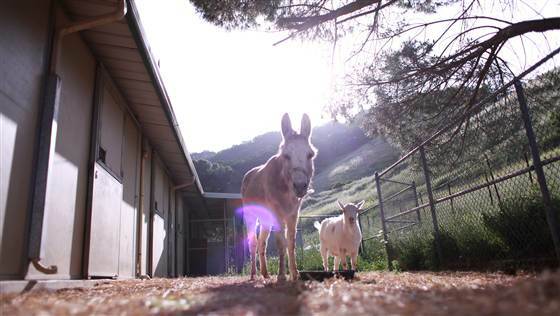 These two adorable friends will never be separated again, as Animal Place is keeping both of them as permanent residents at their 600-acre Grass Valley sanctuary. "Never doubt the depth of emotions other animals possess," Animal Place wrote. "Mr. G’s grief was as deep and mysterious as a human’s. His joy at reuniting with Jellybean was as beautiful and inspiring as a human’s."